Clicktopurchase, the online execution platform for buying and selling property, has released the “clicktopurchase Blockchain”. Unlike so many who have been talking about using the technology, the company has developed and released live its Blockchain in an extremely interesting development for the property industry. In recent months, the interest in potentially bringing Blockchain technology to the property industry has been gaining momentum at a rapid pace. Now it has arrived, for probably the most important thing in a property’s life cycle – its purchase. The platform has developed a significant circa £175m track record for uniquely enabling a property transaction to be concluded quickly and easily, online. A verified bidder is able to submit an offer on behalf of a buyer, this generating an electronic offer with a legally binding electronic signature. If the offer is accepted, by the agent, solicitor or seller operating the dashboard, a second electronic signature is added and an instant online exchange of a property contract occurs. Clicktopurchase already uses “hash” and “encryption” technology when creating audit trails and online property contracts. The flow process has already proven that transactions can occur in days rather than many weeks, so the very essence of Blockchain is already being used by clicktopurchase and now being extended. These transactions are now being recorded in the clicktopurchase Blockchain which has significant implications. Blockchain has been described as a technology which will change all our lives by enabling data to be held in an immutable ledger. By having totally reliable data, exchanges of information and transactions of any kind can occur quickly and easily, removing the many delays caused by intermediaries who are validating information. “The clicktopurchase system already showed how technology can improve a generally difficult process. But now with digital signatures and blockchain data anchoring, the system’s certainty and transparency is world class.” Jonathan Crossland, Lucid Ocean. 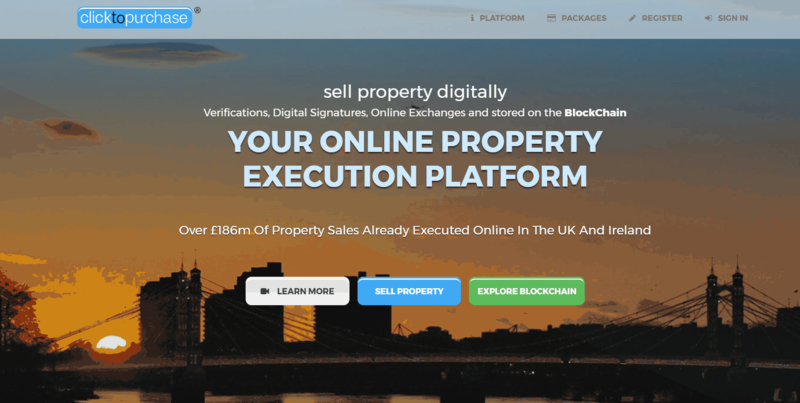 “We’re delighted to see clicktopurchase launch their property blockchain on MultiChain. As far as I’m aware, this is the first live blockchain implementation for the property market, and certainly the first to run on the MultiChain platform. We look forward to seeing the clicktopurchase application and network develop and thrive.” Dr Gideon Greenspan, CEO of Coin Sciences Ltd.
clicktopurchase has been inviting companies to take nodes in the Blockchain network and record data in the ledger. “If you are interested to join us as we help change the property industry, keeping it relevant as technology changes all industries, we would like to hear from you,” added Singer.